The new Transport Hub completed in March 2018 centralises main transport links including Port Talbot Parkway station, a new bus terminal, cycle facilities, a taxi rank and drop-off / pick-up bays in a largely pedestrianised concourse, providing easier access for all to employment and residential areas in and around the town. The Transport Hub was designed to complement the redevelopment of Port Talbot Parkway Railway Station (part-funded with EU funding) by Network Rail and forms part of the Council’s wider regeneration programme. The scheme has been funded by the Local Transport Fund, Vibrant & Viable Places and European Regional Development Fund, through the Welsh Government. The Transport Hub is an additional and complementary provision to Port Talbot Bus Station, where normal services will continue. 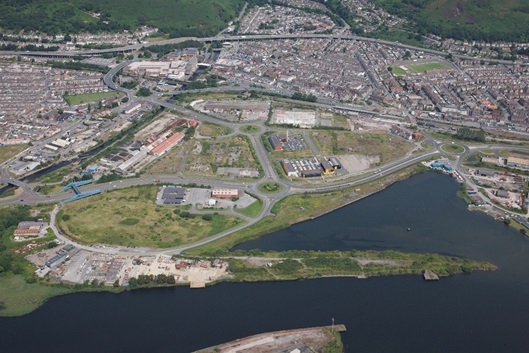 The regeneration of Harbourside strategic employment site will be the catalyst for the redevelopment of the town’s former docks area. The aim of the scheme is to improve the area to create a thriving business hub and attract further private investment to help drive employment growth and sustainable employment opportunities. Once completed, the site will provide land for small scale industrial and office users maximising the advantage of the proximity to the town centre and excellent transport links. The project includes: remediation of former brownfield land; construction of access roads; upgrading of existing highway to adoptable standard; and flood mitigation measures. Enabling future development and making the site viable for further development. It will also provide additional car parking to support the development of the sites. This scheme has been part funded from the European Regional Development Fund, through the Welsh Government. Construction work will commence in the spring of 2019. The Property Infrastructure Fund (PIF) is a Welsh Government scheme which provides financial assistance for the construction or refurbishment of speculative buildings for industrial and commercial use with the primary aim of creating capacity for employment across West Wales and the Valleys. The PIF scheme has been part funded from the European Regional Development Fund (ERDF), through the Welsh Government. The Property for Business Development Grant Fund (PBDG) is a Welsh Government scheme which provides financial assistance for the construction or refurbishment of buildings for industrial and commercial use with the primary aim of creating capacity for employment across West Wales and the Valleys. The PBDG scheme has been part funded from the European Regional Development Fund, through the Welsh Government. The Swansea Bay Technology Centre at Baglan Energy Park will be a hybrid building providing a range of flexible office space to support start-up companies and indigenous business growth with a focus on, but not exclusively, the innovation and R&D sectors. The design of the Technology Centre will incorporate building materials to establish it as a ‘building as a power station’. The building will be located on Baglan Energy Park, near Port Talbot, on the M4 corridor, situated next to the existing Baglan Bay Innovation Centre, which is currently full to capacity. The location has excellent transport links and will support and encourage the growth of strategic sectors in the region (both start-ups and indigenous businesses), in particular the growing energy sector leading to job creation and increased GVA for the region. The project will be part funded by the European Regional Development Fund, through the Welsh Government and the Swansea Bay City Deal. Construction work will commence early 2020. The aim of the Plaza redevelopment is to bring the derelict former cinema back into economic use by providing a facility that will create jobs, encourage economic growth and contribute to the tackling poverty agenda. The building is located in Port Talbot town centre, adjacent to excellent public transport links via the newly refurbished Parkway Station and the new Integrated Transport Hub. The facility will provide flexible business incubator facilities; office / meeting / training rooms; multi-purpose areas for community use; a café / training kitchen facility; and flexible space for community use e.g. social enterprises. This scheme has received approval in principle from the Welsh Government’s Building for the Future Programme, which is part funded by the European Regional Development Fund. Construction work is expected to commence in 2019. The former Magistrates Court is currently a vacant, prominent listed building situated in Port Talbot town centre. The building has historic interest as it was the head offices of the original Port Talbot Steel Company, constructed c.1900, before being converted into a Magistrates Court in the 1980s. The building is located within the Port Talbot Enterprise Zone, at one of the main gateways to Port Talbot via the recently completed Harbour Way road. It is adjacent to the Harbourside strategic employment site area, the newly redeveloped Parkway Train Station and the Integrated Transport Hub. The aim of the redevelopment is to provide flexible office accommodation over two floors, along with meeting and training rooms, bringing with it employment and training opportunities, as well as attracting further economic investment to the area. This scheme has been part funded from the European Regional Development Fund and the Welsh Government’s Building for the Future Programme. Construction work commenced summer 2018 and is expected to be completed by March 2019. The former registrar’s office in Neath Town Centre will be refurbished to provide essential office accommodation that will house both new and existing SMEs, creating local employment and business opportunities, as well as attracting further economic investment to the region. The prominent, listed building has been vacant for over 13 years and the refurbishment will be sympathetic, in order to meet CADW requirements, repairing architectural features wherever possible. The newly refurbished offices will accommodate approximately 47 jobs over three floors. The project has received approval in principle from the Welsh Government’s Building for the Future Programme, which is part funded by the European Regional Development Fund. The refurbishment works are planned to commence in summer 2019, with planned completion March 2020. Workways+ offers training and paid work experience opportunities to long-term unemployed people to help get their lives back on track. Support is targeted at participants over the age of 25 living outside of Communities First areas who are economically inactive, long-term unemployed or have complex barriers to overcome. Workways + helps participants take their first steps to re-engage or enter into the labour market. Backed by £17.3 million of EU funds, the seven-year scheme will benefit people in Neath Port Talbot, Swansea, Carmarthenshire, Pembrokeshire and Ceredigion. Workways+ offers one-to-one mentoring, support with job-seeking and interview skills, and the chance to gain new qualifications. Support will target individuals affected by work-limiting health conditions and disabilities, as well as those with care responsibilities and low or no skills. Communities for Work is a Welsh Government Programme, supported by the European Social Fund (ESF) and co-sponsored by the Department for Work and Pensions to deliver employment support services in the most deprived areas of Wales. Communities for Work is a voluntary programme to help those adults furthest away from the labour market into employment. The programme focuses on providing 1-to-1 support, guidance and training. The project aims to be additional and complementary to existing DWP and other employability programmes. Providing resources and support to help them apply for vacancies. The Cynnydd project will work with those aged between 11 and 24 years old who are at risk of becoming NEET (Not in Employment, Education or Training. Cynnydd is led by Pembrokeshire County Council and delivered in partnership with local authorities, Further Education Colleges and Careers Wales in Neath Port Talbot, Swansea, Carmarthen, Pembrokeshire and Ceredigion. Private and third sector training providers are also involved in delivering this project. The £19 million project is part-funded by the European Social Fund and will work with an estimated 4,500 young people across South West Wales. Within Neath Port Talbot (NPT) Cynnydd provides Youth Engagement Worker support to young people aged 11 to 16 years old. The Youth Engagement Workers are linked to all secondary schools within Neath Port Talbot including Ysgol Hendrefelin and will work with young people to overcome or manage any issues that are contributing to their disengagement from mainstream education. The Cynnydd team also work closely with NPTC Group of Colleges and Careers Wales to help support young people into further education, training and employment. If you have any comments or suggestions regarding any of the projects detailed here, please let us know. We welcome your feedback and will try our best to incorporate any suggestions where reasonable and practical.